BRITAIN prides itself on its expertise in finance. The City is the brightest jewel in the economy's crown. Banks and financiers have based themselves in London because of the depth and sophistication of its markets and the sure touch with which they have been regulated. Until now. The queues that formed outside Northern Rock, the country's fifth-biggest mortgage lender, represented the first bank run in Britain since 1866. The panic was prompted by the very announcement designed to prevent it. Only when the Bank of England said that it would stand by the stricken Northern Rock did depositors start to run for the exit. Attempts by Alistair Darling, the chancellor of the exchequer, to reassure savers served only to lengthen the queues of people outside branches demanding their money. The run did not stop until Mr Darling gave a taxpayer-backed guarantee on September 17th that, for the time being, all the existing deposits at Northern Rock were safe. No sooner had the queues disappeared than the inquest began. This was the first big test of Britain's monetary and regulatory arrangements since Gordon Brown shook them up within days of arriving at the Treasury in 1997. The Bank of England was given operational independence to set interest rates, but it was stripped of its job as the banking supervisor. That was handed to the Financial Services Authority (FSA). The Treasury, the central bank and the FSA reached an understanding about how they should run the system together. Until this summer, Mr Brown's reforms seemed to be working well. The Bank of England was lauded for keeping inflation close to the government's target and ensuring a steady expansion of the economy. The FSA won praise for its deft touch, especially in regulating complex financial businesses, which helped bolster the City's appeal as an international centre. But in just a few days a financial storm has blown a hole in the hard-won reputations of the regulator and the central bank. Mr Brown's new system of split responsibility has failed its first big regulatory test. Mr Darling's guarantee sets a dangerous precedent. It threatens to encourage savers to put their money in high-rate accounts in unsound banks and shareholders to invest in such institutions, comfortable in the knowledge that the government will be there for them when the going gets rough. But by the time the chancellor acted, he had little choice but to save Northern Rock or risk a disastrous run on other banks. The mistakes that led up to his move were made long before September 17th. None of those involved comes out well. Northern Rock deserves censure for its dangerous business model. The mortgage lender, which is based in Newcastle and was formerly a humble building society, had grown too fast, by raising most of its funds from the money markets rather than branch deposits. This left it defenceless against a shortfall in funding when the money markets dried up. Fault for that lies first with the bank itself, but it also looks as if the FSA was asleep. Sir Callum McCarthy, its chairman, acknowledged this week that Northern Rock's business model was “extreme”. Central bankers had for months been warning about the likelihood of credit tightening. The FSA should have paid attention and discouraged Northern Rock from pursuing its risky strategy. The FSA's vigilance is crucial, because it is guardian of the public scheme of deposit insurance. Last year, it said this scheme was working just fine. But when tested, the scheme failed: depositors neither understood nor trusted it. Do you believe in central bankers? If the FSA and the Treasury come out poorly from all this, the Bank of England emerges worst. 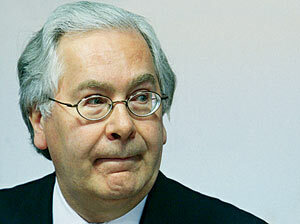 At the outset, Mervyn King, its governor, talked tough. Mr King wanted to teach financiers that they should not expect the central bank to bail them out if they took on too much risk. Unlike the European and American central banks, the Bank of England held back from pumping cash into the markets and then did so modestly, insisting on the usual top-notch collateral. It argued that central-bank money could do little to save the three-month interbank lending market, which had gummed up. The Bank of England's tough line has turned out to be wrong, and events have forced Mr King to relent. On September 19th, the day after the run on Northern Rock had ended, the Bank of England performed a breathtaking volte-face. It announced that over the next few weeks it would indeed be providing funds to try to sort out the three-month market. Furthermore, it said that it would lend against riskier collateral, including mortgages. The charge against Mr King is that his purism turned a crisis into a fiasco. If the Bank of England had acted more promptly to restart seized-up lending markets, his critics say, Northern Rock might have muddled through. No one will ever know whether that is true. Either way, the lurches in the central bank's policy leave Mr King looking either as if he made a mistake, or as if he cannot stand up for his views. Neither characteristic is much sought after in a central banker. This debacle holds lessons for the way Britain regulates its banks. As Mr King pointed out, defending his performance in front of a House of Commons committee on September 20th, the law prevents the Bank either from staging a covert rescue operation or from engineering a swift takeover; and flaws in the protection of depositors mean that, once an overt rescue operation is under way, depositors will flee. Mr King defended the separation of powers between the Treasury, the Bank and the FSA, but he was wrong to. It has exacerbated the system's flaws: nobody was in charge of the operation. So why weren't changes made? For that, the people running the system, not the system itself, are to blame. Nobody trusts politicians. Regulators are always disliked. But central bankers are held to a higher standard; which is why Mr King is the past week's main victim. He has lost credibility; and a central banker without credibility is not much use.